Furikake (Fooree-ka-keh) is a ready-to-use table condiment. 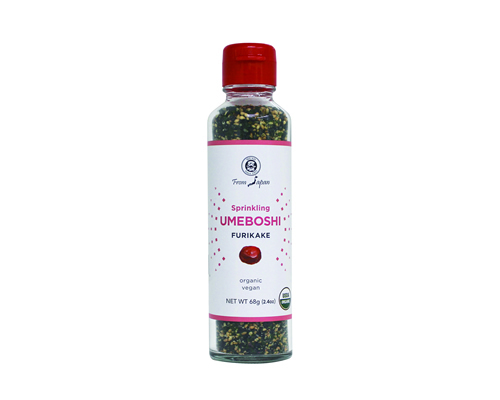 From Japan TM, Organic Furikake Flakes use only plant-based ingredients and free of additives and artificial flavors. Just sprinkle it on grilled meat or fish, a bowl of rice, or anything else where you want to deliver an extra pop of flavor and satisfying crunch. It can be a topping for noodle dishes and even a salad seasoning. It is a condiment in its own right. 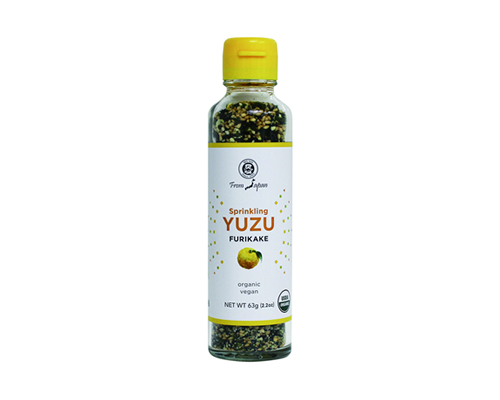 Ingredients: Toasted White Sesame Seeds*, Salt Cured Toasted Black Sesame Seeds*(Black Sesame Seeds* and Sea Salt), Ground White Sesame Seeds*, Dried Yuzu Citrus Zests*, Green Nori Flakes, Sea Salt. Ingredients: Salt Cured Toasted Black Sesame Seeds*(Black Sesame Seeds* and Sea Salt), Toasted White Sesame Seeds*, Ground White Sesame Seeds*, Dried Umeboshi Flakes* (Ume Plums*, Shiso Leaves*, and Sea Salt), Dried Shiso Flakes (Shiso Leaves* and Sea Salt), Green Nori Flakes, Sea Salt. Ingredients: Salt Cured Toasted Black Sesame Seeds*(Black Sesame Seeds* and Sea Salt), Toasted White Sesame Seeds*, Ground White Sesame Seeds*, Green Nori Flakes, Sea Salt. Ingredients: Salt Cured Toasted Black Sesame Seeds*(Black Sesame Seeds* and Sea Salt), Toasted White Sesame Seeds*, Ground Black Sesame Seeds*, Ground White Sesame Seeds*, Ground Sansho Peppers, Sea Salt, Green Nori Flakes.